What is life like in Damascus? Jump to media player As the Syria conflict enters its fourth year, the BBC's Rami Ruhayem looks at what life is like for the residents of Damascus. Syria: Inside a Jordanian refugee camp Jump to media player More than 2.5 million people have fled Syria since the start of the conflict, most of them women and children. Syria conflict: is it stalemate? Jump to media player Paul Adams examines the major developments over the last year in the Syria conflict. 'Time to honour Syria promises' Jump to media player The head of the Syrian Opposition Coalition Ahmed Jarba, has said the time has come for the leading members of the Friends of Syria group to honour promises to supply heavy weapons to the free Syria army. Homs: Living under siege Jump to media player A video sent to the BBC by activist group Masarat, shows what life is like for people in the besieged city of Homs. Plight of Syria's refugee children Jump to media player The number of Syrian children in need has more than doubled in the past year to 5.5 million, according to the UN's children's charity, Unicef. UN's food worries for Syrians Jump to media player The World Food Programme says it has a serious funding shortfall for its work in Syria. Syria Conflict: What is everyday life like in Damascus? 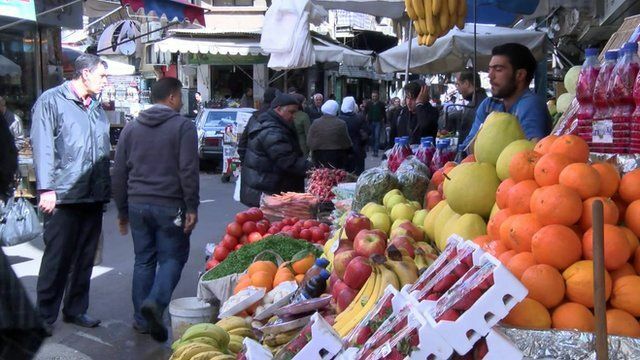 As the Syria conflict enters its fourth year, the BBC's Rami Ruhayem looks at what life is like for the residents of Damascus.